Ordinary readers use left-brain systems, but dyslexic readers rely more on right brain areas. Researchers Judith Rumsey and Barry Horwitz at the National Institute of Mental Health used positron emission tomography (PET) to compare regional cerebral blood flow (rCBF) among dyslexic and nondyslexic men. 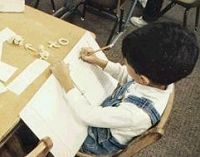 The dyslexic subjects had childhood histories of dyslexia and continued to show some symptoms related to reading, but their overall reading ability varied. 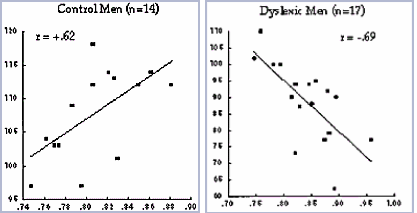 For some word recognition and comprehension tasks, the dyslexic men scored as well as or better than controls. Research correlating brain activity with reading ability showed an intriguing inverse relationship between reading ability and cerebral blood flow patterns. For nondyslexic controls, stronger activation of left hemispheric reading systems, including the left angular gyrus, corresponded to better reading skill. For dyslexic subjects, the opposite was true: the stronger the left-hemispheric pattern, the poorer the reader. In contrast, increased reading skill for dyslexics was correlated with greater reliance on the right hemispheric systems. Dyslexic men show opposite patterns from controls, with reduced reading ability as left brain use increases. The researchers observed a similar pattern in the right hemisphere, in an area near the right angular gyrus. In the right brain area, the dyslexic men had higher activation levels than controls during the word reading tasks, which correlated positively to improved reading ability. For the nondyslexic control group, such activation pattern was negatively correlated to reading ability. A team of researchers led by Sally Shaywitz at Yale University confirmed that dyslexic individuals who become good readers have a different pattern of brain use than either nondyslexic readers, or dyslexics who still read poorly. The researchers used functional magnetic resonance imaging (fMRI) to evaluate brain activity among 20-year-old dyslexic men and women selected from a group that had been followed since kindergarten. All the dyslexic subjects had a history of severe reading impairment in early childhood. However, while some of the students continued to struggle with reading throughout their school years (“persistently poor readers”), others improved by their high school years, becoming accurate readers with strong comprehension skills (“accuracy improved readers”). Dyslexic subjects from both groups as well as non-dyslexic control subjects were asked to perform reading tasks involving phonological processing (non-word rhyming test) and ascertaining meaning (semantic category test). During the non-word rhyming test [“Do leat and jete rhyme? ], both dyslexic groups showed less activation of the left posterior and temporal areas of the brain as compared to the control group. However, the dyslexics who were improved readers also had greater activation of right temporal areas and both right and left frontal areas. Ordinary readers use the left temporal area for sounding out words. Poor readers do not use the left temporal area to find the sounds of words. Capable dyslexic readers show greater reliance on right brain areas. For the semantic category test [“Are corn and rice in the same category?”] the persistently poor readers showed brain activity very similar to the nondyslexic control group, despite the fact that their reading performance was significantly impaired. Like the control group, the persistently poor readers activate left posterior and temporal systems. In contrast, the improved dyslexic readers bypassed this area entirely. Ordinary readers also use the left temporal area when reading for meaning. Persistently poor readers show brain activity like non-dyslexic readers. Dyslexics who are capable readers do not activate the left temporal region. These brain imaging studies show that teaching methods that may work well for a large majority of schoolchildren may be counterproductive when used with dyslexic children. Teaching methods based on intensive or systematic drill in phonemic awareness or phonetic decoding strategies may actually be harmful to dyslexic children. Such teaching might simply emphasize reliance on mental strategies that are as likely to diminish reading ability for dyslexic children as they are to improve it, increasing both the frustration and impairment level of dyslexic students. Davis Learning Strategies® and Davis Dyslexia Correction® emphasize a creative, meaning-based strategy for acquisition of basic reading skills. Children (and adults) use clay to model the concepts that are associated with word meanings at the same time as modeling the letters of each word in clay. At the primary level, these methods provide a route to learning to read that seems easier for students with dyslexic tendencies than traditional instruction. Among older dyslexic children and adults, these methods routinely lead to very rapid progress in reading ability. Modeling words in clay may help build the mental pathways that brain scan evidence shows to be crucial for reading development among dyslexic students. This image combines a DTI (diffusion tensor image) image showing white matter pathways in the brain of a dyslexic man (in blue) overlaid on an image of the brain pathways of a person with more typical brain architecture (in gold). 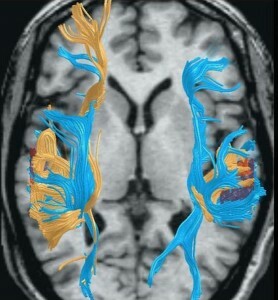 The image shows that while the dyslexic man has somewhat less well-developed left brain connections, his right brain connections ae far more extensive than his non-dyslexic counterpart. Thank you for your very informative research articles. I am a UK teacher (re-trained in 2011 as Dyslexia specialist, now ALMOST a Davis Facilitator). Also married to a dyslexic and have two dyslexic children. Has anyone done scans of what happens in the non-dyslexic brain when using Davis approach? ie. will all children benefit equally from it or does it really only suit right-brained people? The Davis tools can be used by anyone, whether dyslexic or not — as long as they are given a form of orientation consistent with their learning style. For example, an non-dyslexic person would probably be more comfortable with Davis Alignment rather than the minds-eye Orientation approach. In schools where Davis Learning Strategies has been implemented at the primary level, all children have done well and all are able to effectively use and integrate Davis tools. The main difference is simply that for an older nondyslexic child who has already learned to read well, there would be no particular benefit in introducing a different approach for reading. Their brains have already adapted to read efficiently. Ideally each person should be able to acquire reading skills relying on the mental pathways that are the most comfortable for their own thinking style. I have two children with learning difficulties. One Dyslexia and one ADD/ADHD and dyspraxia..I also think Dyslexia. I agree with all of your statements about the genius behind these conditions. However as a parent I am looking for support for my children’s self esteem. One is ok and the other is losing his confidence, displaying anxiety and in some stages depression. Right now anything that will support him through the current education system will be of benefit to him…get him through it alive…If I can do that then I know he will fly. My heart is breaking for my children as I see and know their awesomeness but feel as mum right now I don’t count. Sandy, I think that self esteem goes up when the child understands and can use the strengths that are part of the dyslexic mind. That’s why the Davis program is built around giving tools for mental control and using strategies based on dyslexic strengths (like creativity) to address problems with reading. Bottom line, the child needs to experience success and have that success be connected to to their abilities. I am currently working as a Writing tutor at a community college and have been called upon to tutor many different subjects such as Phonics. I feel out of my realm of expertise. Please help! Very, VERY well said Daniel! This suggests that given the same input / problem to solve, the left brained non-dyslexic person is likely to come up with an anticipated outcome. Where as the right brain person with so-called dyslexia is going to deal with the problem very differently and will most likely produce a very different outcome. So long as we examine and expect a particular mind set as being correct (conventionally that of a left brained thinker, also regarded as normal) then we will loose all those people that have the ability to comprehend the world differently. There are many examples (such as Einstein) who would have been sifted out by our education system as a dyslexic and failed all our current examinations! This is obviously not to say that all dyslexics are geniuses but almost certainly most are worthy of very much more than our current system is recognising and could be part of the solution to the ‘out of the box’ thinking that is so often needed. May I add some input into your excellent comments. This year I retired, so my education took place BC, ( before computers and calculators). but AD ( after the dinosoars). My dyslexia was not noticed at school or Uni. Like Mr Davis I was excellent at science and engineering, but terrible at English language (reading) , history, French especially with the small words without visualisation. Ten years ago, I did a part time degree in Occupational Therapy, ( 3 out of a 4 year course) at a Uni in London. It seemed that a very large percentage of our class, and the year below, had been diagnosed as Dyslexic. The Uni was offering a free diagnostic test for those who passed the assessment. So I was intrigued….. I blagged my way onto the test as I was interested in Cognitive Assessment, having just done a secondment in Stroke rehabilitation as part of my course. Well I was diagnosed with a ‘mild ‘form of Dyslexia’ despite having spent most of my adult years studying different subjects. Back in around 1984 , whilst working as a Scientist in the Chemical Industry, I attended a weeks career assessment course run by an Independent company. I did brilliantly in the problem solving test, getting scores that beat the top directors of our Multi National French Company, but terrible in other tests. The computer character assessment, at the end of the week, was that I was a highly creative megalomaniac. I wanted to take over the world in an artistic way. My dyslexia hadn’t n been diagnosed then, but the assessment was correct. The company refused to believe it was correct. claiming that I had blatently fooled the computer as I wasn’t ‘normal’. Strangely, Hitler was very artistic and a vegetarian, Winston Churchill was also very artistic. Draw your own conclusions. I have this tentative theory that perhaps half the population is ‘Dyslexic’ , but is never diagnosed as such. it’s never a ‘learning diasbility’ but as Mr Davis says It’s clearly a gift. To be ‘cured’ would destroy who I am. Anyway, fast forward, I am now retired, living in China. and recently head hunted into teaching young Chinese children to speak English. This seems to be the latest fad amongst those who have some cash to spare. However, it seems the custom to allow parents to sit in to the lessons. The parents insist that I spend the whole time repeating the same words Parrot Fashion., until their children submit. I refuse for obvious reasons, (see the comments on this site regarding repetitive learning ) and I am removed from the class. It is interesting because there is no logic in learning the sound of Chinese characters, its purely memorising things without logic. But this does not work with English, which is not entirely logical. I suspect Parrot Fashion is probably ok in Chinese. I am slowly trying to introduce the concept of Dyslexia here, especially as we have one young boy who is brilliant at English but show signs of Attention Deficit and Hyperactivity and antisocial behaviour. All of which I recognise from my youth, I am slowly trying to adopt a multi dimensional approach to English teaching to include, pictures, music and fun. (as I enjoy all three). I have been asked to teach 5-6 year olds, and 7-8 year olds, all in Parrot Fashion. All lessons have thankfully been a disaster, and I have thankfully been replaced So far I have been teaching 4x 11-12 year olds, for 2 months, despite one mother constantly complaining about lack of “Parrots’, I am still in business. Good luck to you all. Thanks for such an intelligent website. By the way I discovered it via borrowing the ‘Gift Of Dyslexia ” book from our library in UK shortly after my diagnosis. A Brilliant Book for everyone to read- and that is from someone who has problems reading books. I also am an educator, but interpreted this very differently. I don’t think they’re saying we should change the kids, they’re saying we need to change how we teach in order to reach the people who learn differently. U no. All my life i thought i had a problem. Simple things like knowing who sang certain songs was easy for my friends. But it was very hard for me. Growing up i loved to read. But i could read the same book over and over and enjoy it every time. Over the years i had to teach myself in my way. When i was young. I taught myself how to wire and install heating n cooling systems in a house the proper way within 2 years. I even argued that the calculation for sizing these systems was wrong. So i sized them my way. I was told by so called experts that they were to big. But i never had 1 homeowner compaint. Most houses have major air leaks And these so called energy eff windows failed within a couple of years I was the only one who could deliver a good cool system in the middle of Aug. I never understood why something that i thought was so simple. Educated people didnt get. Lol. Now i no. It only took 54 years to figure out why i am like i am. Sad that it took so long.